It's February, and that means New York Toy Fair time! Although, this year is quite different from earlier installments (2018, 2017, 2016, 2015 & 2014) as it's accompanied by the official statement from Hasbro that the upcoming 9th season of Friendship is Magic will be the final one for the generation. Everything points towards an upcoming 5th generation afterwards, but you'll find no hint of that on the fair this year. 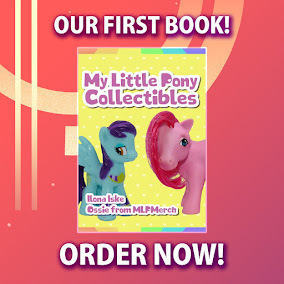 Instead it's a line-up that pretty much covers everything that has been announced in the past few weeks, including the recent waves of Cutie Mark Crew and brushables that were released in late 2018. Though, we do see some new sets on display at the fair this year, with the 2019 series called "Rainbow Road Trip" which ties in with an upcoming special. 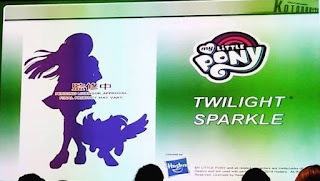 And there's some amazing news from other companies too, including Kidrobot, who are releasing their first My Little Pony figures this year! 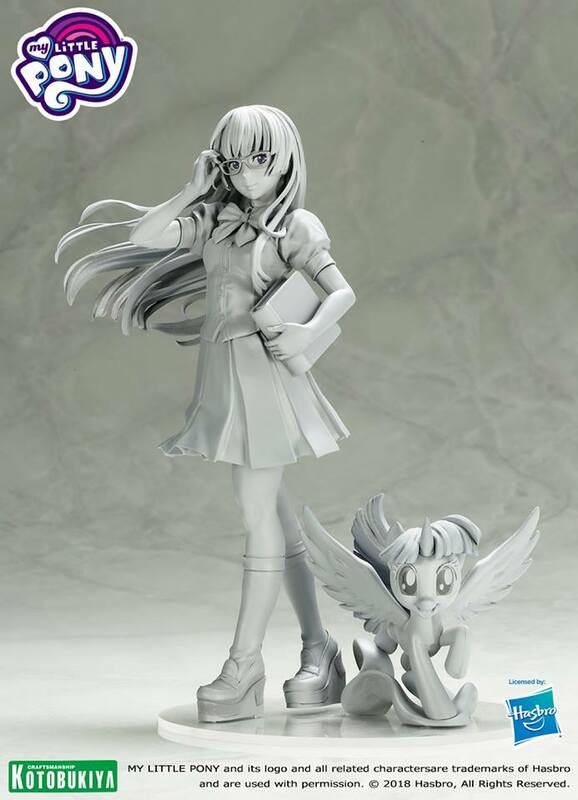 Earlier this week we reported on the final design of Kotobukiya's Twilight Sparkle Bishoujo statue, and now the pre-orders for her are open! With $99.99 as the MSRP it's an expensive piece, but as seen on the images below you get an immensely detailed statue in return. 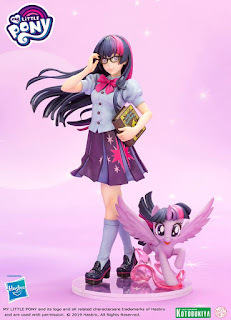 Both the 8.46" tall human character as well as the Twilight Sparkle pony are uniquely designed and molded with eye for detail. Take a look at the Elements of Harmony book for example! 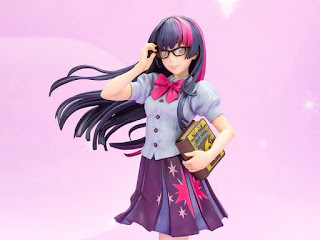 With the Pinkie Pie Bishoujo Statue being fully revealed and up for pre-order, it was only a matter of time before Kotobukiya would be teasing their next statue: Twilight Sparkle. We already got a look at the concept art for this statue but now Kotobukiya has posted the sculpt on their Facebook Page. Just like Pinkie Pie this figure is very detailed and the sculpt looks absolutely amazing. I bet she will look stunning when the colors are added! After a long series of teasers Kotobukiya finally made the Pinkie Pie bishoujo statue available for pre-order today. Not only that, but the new listings contain additional photos of the figure and the "final product may vary" notice has been dropped. We couldn't spot any major changes so soon, but this is the first time the figure could be seen in such detail! You'll find these photos further down this post. International customers will be able to pre-order a statue through Entertainment Earth, where it's listed for $99.99. The release date in the US is set for late June / early July 2019, so we'd have to keep our patience for a few more months! About three month ago Kotobukiya revealed the first My Little Pony Bishoujo Statue. While unpainted the statue was already impressive to look at with some amazing details. 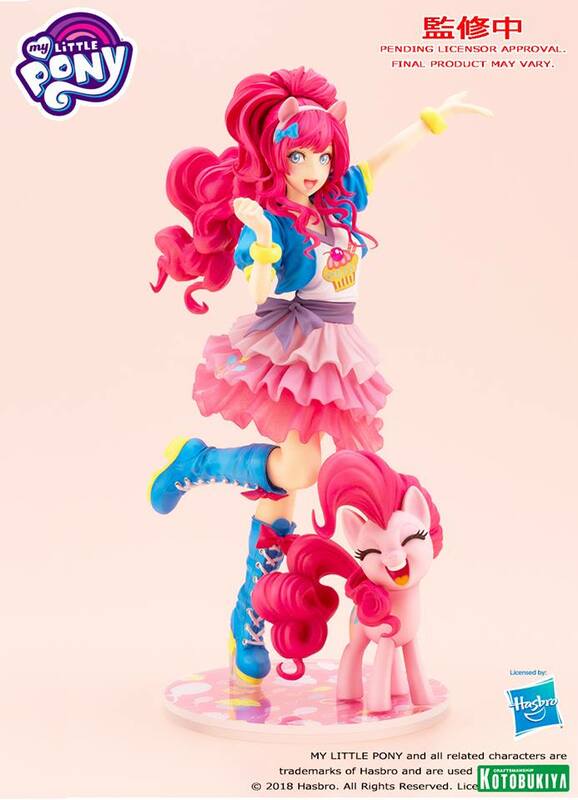 But now Kotobukiya has revealed the fully colored Pinkie Pie Statue on their Facebook! We can clearly see that this piece is one lively-colored piece of sweetness. I particularly like the balloon-base as well. They really pay attention to detail. Today we have a special guest report from Anto, who was kind enough to shoot photos at this year's San Diego Comic Con of everything My Little Pony that was on display across the convention floor. 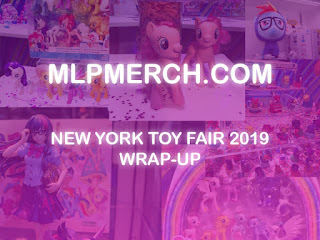 Hasbro had a relatively large booth this year with lots of items that are going to be release this year, including Cutie Mark Crew, Ultimate Equestria Collection and Best Gift Ever sets. 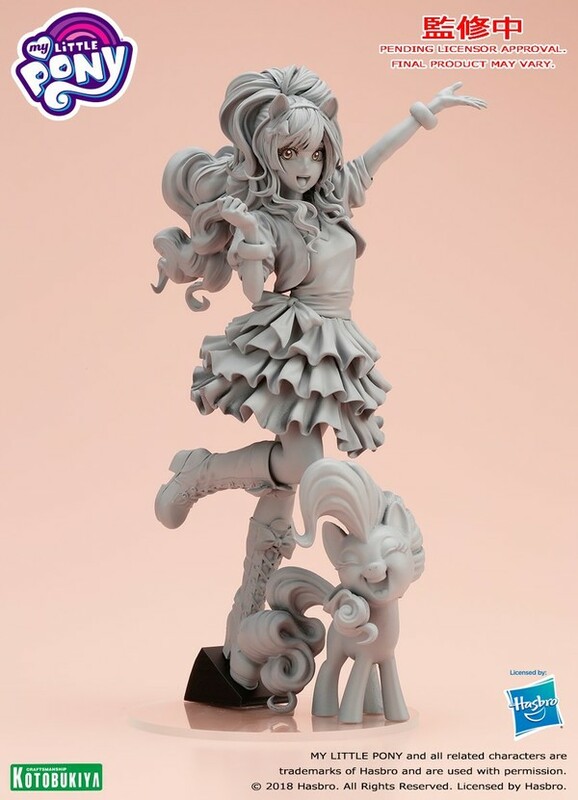 And of course we get to take a peek at an actual prototype of the Pinkie Pie Bishoujo statue can be seen. Kotobukiya has revealed a prototype for the first statue of the Bishoujo Series. 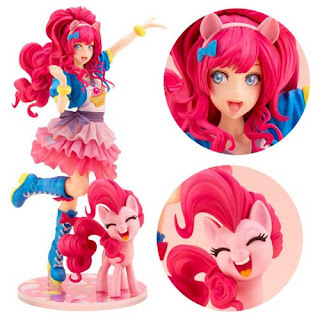 As you can see it's Pinkie Pie and they did a great job translating the illustration to a 3D-statue. The details on this figure are absolutely amazing! Kotobukiya's original announcement of the Bishoujo Pinkie Pie statue already teased about a complete line, and this week we got the confirmation that there will at least be a second statue in the series! On a Japanese blog's Twitter an image was shared showing that Twilight Sparkle won a poll for who the second figure would become. According to sources, the poll consisted of both mane 6 and non mane-6 ponies. As seen in the image above, no further information is available on the design or release of the new figure. In fact, we're still waiting for addition info on Pinkie Pie, so we need to keep our patience a bit longer for these very promising figures! 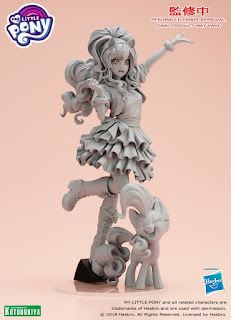 While we were all focusing on the Toy Fair in New York, over in Japan at the Wonderful Festival a completely different announcement regarding My Little Pony merch was made: Kotobukiya is partnering with Hasbro to create actual Bishoujo statues! 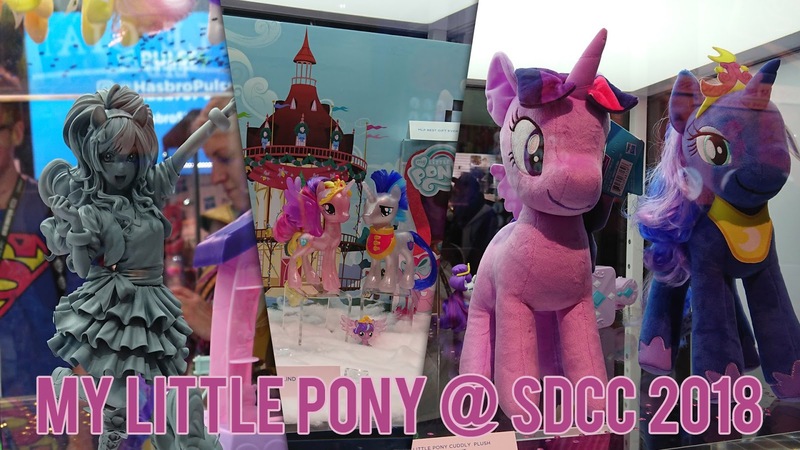 Directly during the convention they also put out an official statement and better image on their Facebook page confirming Shunya Yamashita as the illustrator and more figures from My Little Pony and GI Joe coming too. 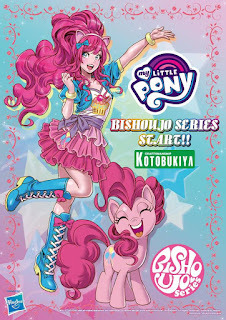 The teaser images shows a highly detailed Equestria Girls Pinkie Pie, but also a regular pony version of her. It's unknown if these will be combined in a single figure, or if both will be released as separate statues. Personally I wouldn't mind either option! At the time of writing no further information on release dates, prices or actual product designs is known. But once the release is inbound, there's some good news for oversees fans: The statues of Kotobukiya are usually well available outside of Japan. Thanks to Ayu, Amanda & shadowcat456 for the heads-up!